Do you realize what an amazing thing it is that God has supplied everything we have needed for our ministry and our personal needs and the needs of our team for over 32 years? He has an ocean-like supply to meet all our needs. This means that many tens of thousands of dollars have come in to this ministry every year without solicitation to anybody but God alone. He did it again this year, providing over $210,000 for our living and the ministry he designed for us to do. Please stop a minute and wonder about this, consider the beauty of it, see the love of God in it, be amazed by it along with us. Though we have come to the edge many times over these years, God has not failed us by the time his supply was actually needed. Only once was I late in a personal bill by one day—a needed lesson for me. Literally, a few million dollars have been supplied to us by God without a single request made to any human, all because he is the kind of Father he told us he would be. You might imagine that by now our faith would have worn thin and become frail. But God has not allowed that. Rather we feel more encouraged than ever to believe our Father will supply all of our needs. It is simply difficult to doubt that anymore. God has led us into this “no solicitation” approach to finances in ministry in part to make our lives, in some visible way, a living testimony for others. Please note this however: We do not think this is the only approach to ministry. God leads other ministries and other godly persons to handle finances in different ways. But this is the approach God has given us to live out. And we would be disobedient to him to reject his guidance. Nor do we believe we are the only people who are trusting God in ministry. How foolish it would be to think such a thought! The life of faith is to be lived by all of us regardless of our approach to finances. God is the one who leads his church in the way he wishes, and we don’t question his wisdom. But we are grateful. We should be, right? We hope you’re grateful to God with us and will continue to pray for us that our faith would grow and that more would be done for Christ to whom we owe everything. 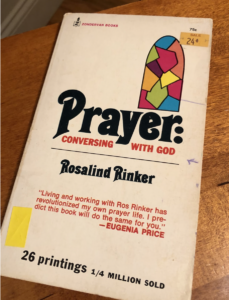 Well, it isn’t an ancient book, but one that came along in 1959 called Prayer: Conversing with God by Rosalind Rinker. I found a copy the other day in a thrift store. Its pages are yellow, crisp, and underlined. It sold at the time for (imagine this!) 24 cents. That was the sale price; it retailed for 75 cents. It sold a lot of copies back then, and I was just one of a quarter of a million who bought a copy. 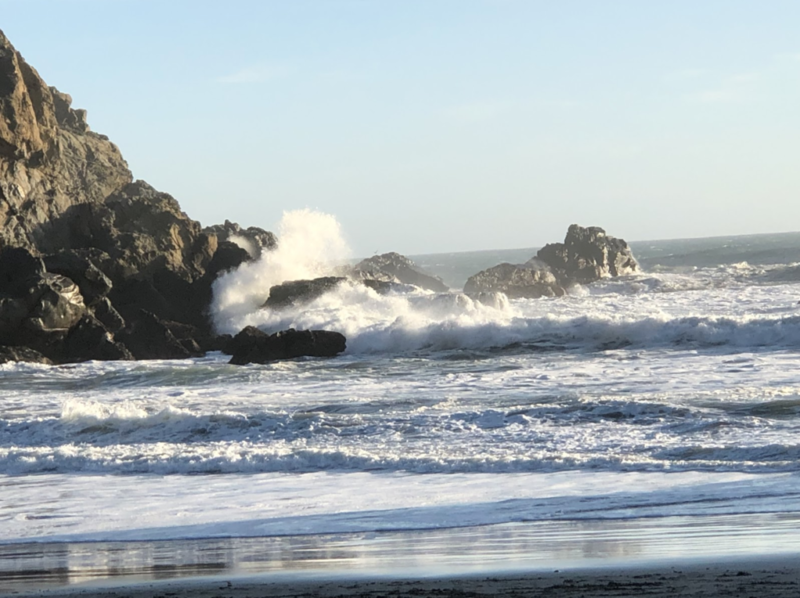 It wasn’t one of the great enduring books of the Western world by a proven Bible scholar, but a simple devotional book at the right time in the Spirit’s hand to meet my need. How like the Lord to use such a tool to make a difference. Never doubt the ability of God to use something seemingly insignificant to carry out very important business in our lives. with him as we do with others. She didn’t mean that we would be irreverent, but just normal in our language. Though some of us had known the practice of praying “sentence prayers” around a circle, she went much further. We could actually expect God to guide us in our praying. We didn’t need to pray impressive spiritual-sounding sentences, but to speak straightforwardly with our simple requests. We should pray one request at a time and come back in with other requests or praises other times. And there was no need to always say, “in Christ’s name,” of course. Once a subject is introduced by God’s leadership, several could pray concerning that issue until something else is introduced. We should also learn to pray “faith-sized” requests, she taught, leaving room to grow our faith. For instance, if we could not trust God for an all out opportunity to share the gospel with someone, perhaps we could ask for a casual encounter with that person—a first step. Then, with our faith encouraged, we could ask for more. I was at that time in seminary in Ft. Worth, but was leading a large youth group in a church in Garland, Texas, a growing suburb above Dallas. On Wednesday evenings, our youth gathered in our own place to pray. Usually that meant Bible study rather than prayer, because prayer normally didn’t work so well with the group. Soon I had introduced what I had learned and the youth group came alive in prayer. I’m serious. It was a complete reversal. They would pray sometimes for thirty minutes or an hour. Some even met together at other times to pray. And it was passionate prayer. Along with all this, God began to answer our prayers and the excitement in the group grew. Among many wonderful things that happened, we witnessed the conversion of scores of young people over those days. Amazing. Soon after this I was asked by one of our professors in the seminary to teach on the subject for his classes. God used it. We experimented in the classes so that others began to see the value of making changes in our understanding of what a prayer meeting can be. I don’t at all have a perfect affinity for everything Miss Rinker says—I saw this again as I read over the book today—but the heart of it is so important that I hope I never forget its valuable lessons. I’ve read many books on prayer, but I suppose this was one of the two or three that really changed something in me. I believe you may be able to read it in Google Books, or maybe find your own crusty copy in a thrift store. An idea birthed in us can make a huge difference. 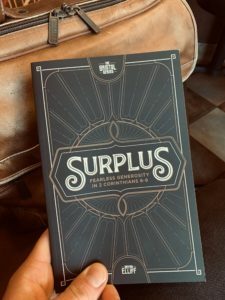 We now have the first copies of the new book by Bryan Elliff I’ve been telling you about—Surplus: Fearless Generosity in 2 Corinthians 8-9. It looks great. We’re waiting now to install the changes on the website that will allow you to purchase it in bulk for discount prices. We’ll also make sure that single copies are on Amazon, and hopefully other outlets. The voluntary release of the believer’s surplus is a powerful thing. We’ll all be challenged by this book. In our Bristol series for thinking Christians our books will be true text-driven works so that we can see how the author of the biblical passage develops his appeal and rationale. This may be perfect for your class, leadership team or mentoring group to read aloud and discuss together, or just a stimulating read to share with friends. We’ll let you know as soon as we’re ready. Steve has just returned from Mumbai, India, with reports of eager students learning God’s word. I’m working on a trip to South Africa in May with hopefully several venues for both evangelism and teaching believers. Stateside trips are filling our schedule also, though we can work others in as we go along. We’re excited about the year ahead. Please pray for us as often as God brings us to mind.